Let your creativity bloom and grow! Combine your favorite designs with colorful fabric prints, and add a delicious look to your dining decor. 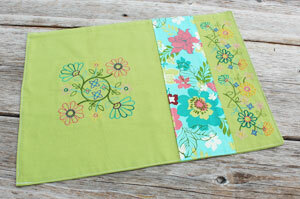 This placemat pattern features a square design and a border design, separated by a strip of fabric. The combination makes the designs focal points, with splashes and dashes of color from the fabric. I used the large size of the Wild About Flowers (Vintage) design and the large size of the Beautiful Blossom Bunch Border (Vintage). 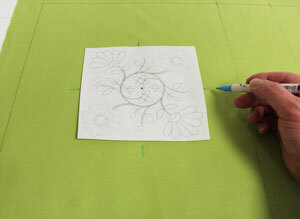 The embroidery areas for the placemat as shown are 10 1/4" wide by 12 3/4" high for the larger area, and 3 1/4" wide by 12 3/4" high for the smaller area. You can use these dimensions, or you can position the fabric anywhere you like, or use a larger or smaller fabric piece on the placemat, to create different size areas. 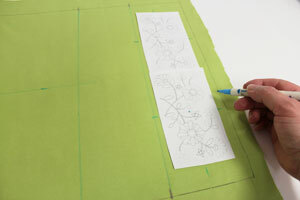 I began by outlining the shape of the placemat, and marking the areas for the three sections. 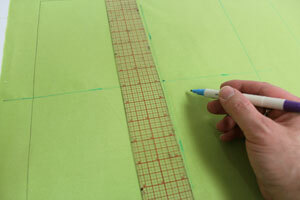 With an air-erase pen, I drew a 20" wide by 15" high rectangle on the sturdy cotton fabric (I used lightweight canvas). I left a couple of inches of excess fabric around the shape for hooping. I measured and marked 4 1/4" in along the top and bottom edges starting at the top and bottom right corners. Then I measured and marked another 4" in from the marks I just made, and drew lines connecting the marks. The area between the lines is the space where the print fabric will go later on. 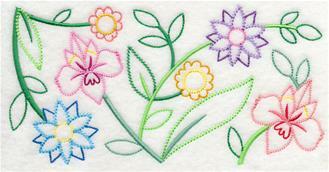 The areas on either side of the lines are the embroidery areas. I find it helpful to use templates to position designs, so I created paper templates of my designs by printing them at full size with embroidery software. If you are new to using templates, click here for a quick tutorial. After trimming around the designs, I placed the Wild About Flowers (Vintage) design template in the center of the larger area. 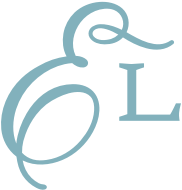 I centered the design side to side and top to bottom by measuring equal distances between the center point and the outer edges of the area. I also moved the template another 1/2" over to the right. 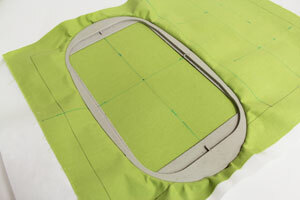 This will center the design within the area after the seam is sewn in a later step. Then I marked the horizontal and vertical axis points. After making all my marks in the step above, I removed the template and drew lines connecting the marks. Since I'm repeating my border design on the smaller embroidery area, I positioned two templates of the Beautiful Blossom Bunch Border (Vintage) along the right side of the placemat. I centered the designs as I did for the larger design, then moved the templates over another 1/2" to the left to allow room for the seam on the right. I also left about 1/2" space in between the designs. I measured and marked the center and axis points, then removed the templates and drew lines connecting the marks. Spray a piece of medium weight cutaway stabilizer with temporary adhesive and smooth the fabric on top. Hoop the fabric and stabilizer together for the first design by lining up the marks on the hoop with the lines on the fabric. 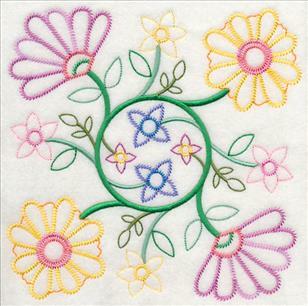 Then attach the hoop to the machine and load the first design, moving the hoop so that the needle is directly over the center point of the fabric, and embroider the design. 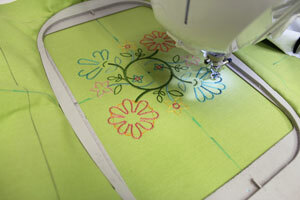 After the design is embroidered I carefully trimmed away the stabilizer from the backside of the embroidery. Then I hooped the fabric and stabilizer together as I did earlier, and embroidered the two designs onto the right side of the placemat. 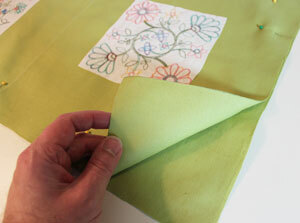 For the fabric piece between the two embroidered areas, I cut a piece of print cotton fabric to 5" wide by 16" high. Then I folded the long side edges over to the wrong side and pressed with an iron. Next I aligned the print fabric panel on top of the embroidered piece, right side facing up, with 1/2" excess on the top and bottom extending past the edge of the embroidered piece. 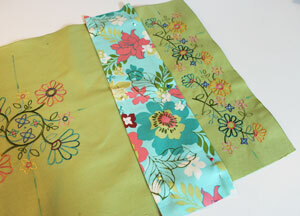 I pinned in place and sewed a 1/8" seam along the side folded edges only. I trimmed away the excess print fabric at each end so that it was flush with the edges of the front fabric piece. 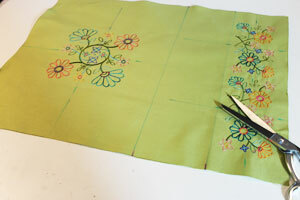 To prepare the back fabric piece of the placemat, I placed the front embroidered piece on top of the fabric, right sides together, pinned in place, and cut around the shape of the front piece. 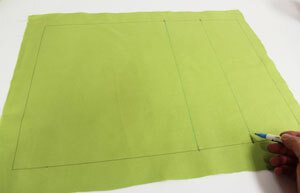 Sew a 1/2" seam along the top, bottom, and one short end of the fabric, leaving the other short end open for turning. 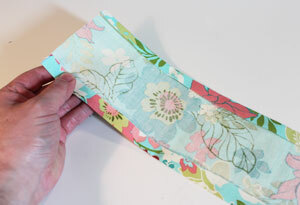 Turn the fabric right side out and press the seams, then turn the fabric of the opening in 1/2", press, and pin in place. Top-stitch a 1/8" seam along the entire outer edge of the placemats. And your placemat is complete! 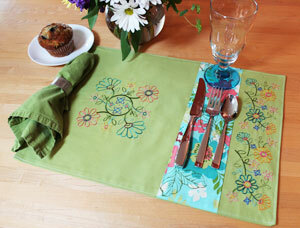 Dress up the dining room and the patio with fresh and stylish placemats! 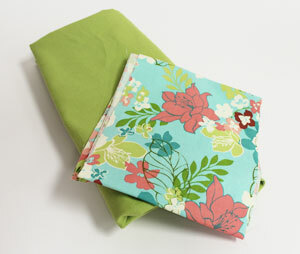 These pretty and practical linens are terrific in any setting. 7.78" x 3.93" | 6.88" x 3.48" | 5.88" x 2.98" | 4.88" x 2.48" | 3.87" x 1.96"